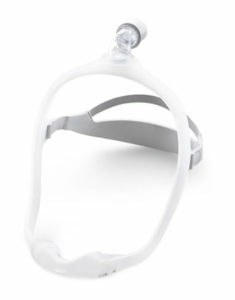 DreamWear Nasal mask combines the innovative hose on the top of your head design with the nasal cushion that rests under your nose. The minimal design gives you a full field of vision to read or watch TV before falling asleep. Comfortably wear your glasses. The nasal cushion rests under your nose – not over it or on it. DreamWear’s innovative design* prevents red marks, discomfort, or irritation in the nostrils or on the nose bridge. Three frame sizes and four nasal cushion sizes so you can find the fit that works best – and most comfortably – for you. ** Data analysis at 30 days of use of 2015 Philips sponsored patient preference trial (n=98). Prescribed masks include ResMed Swift FX, ResMed Mirage FX, Philips Wisp, and ResMed AirFit P10..